King Solomon’s principles for ruling his people included fairness, just dealings and prudent action – notions stated again and again in his Proverbs and the Book of Ecclesiastes. “Envy not the unjust man,” he says in Proverbs 3:31, “and do not follow in his ways.” The sovereign also advocated the rule of law: “Keep the law and counsel, and there shall be life to thy soul and grace to thy mouth, “ he says in the same chapter, verses 21 and 22. Today, a variety of settlements, legislation and lawsuits have been aimed at forcing the scandal-ridden giants of mortgage lending to keep the law and not behave unjustly. 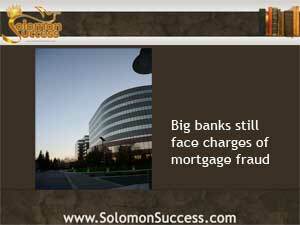 But even in the wake of the mortgage collapse of a few years ago and continued allegations of fraud, the nation’s big banks continue to face legal actions aimed at punishing fraud and establishing accountability. It’s an unusual move in a long series of legal battles between the banks and various watchdog bodies intent on cleaning up the scandals surrounding mortgage lending. But it’s not the first move. According to industry reports, for over a year the courts have been denying the defendants’ motions to toss out the suit, citing limitations imposed on discovery and other processes that put them at a disadvantage. This case is among the latest in the continuing rounds of legal actions attempting to hold mortgage lenders accountable and establish standards of fair practices in the mortgage lending industry. Some of the defendants are involved in other, separate actions as well. Citigroup agreed – without admitting wrongdoing — in March 2013 to pay over $700 million in response to charges that the group deceived investors And Bank of America continues under investigation for accusations of fraud connected to LIBOR, the London Interbank Offered Rate that stands as the standard for short term interest rates worldwide. Mortgage industry professionals and housing industry experts are closely watching the outcomes of these actions – the latest in a long series of attempts to bring accountability to mortgage lending. As the nation’s largest lenders work hard to position themselves as victims of a series of legal vendettas, the industry’s credibility suffers. And as new waves of fraudulent practices come to light, these legal actions aim to create a safer, fairer lending environment for the real victims – mortgage seekers including homebuyers and independent investors working with Jason Hartman’s principles for creating wealth with income property.